Does this injury make my thumb look fat? As you can see, my right thumb is swollen. This photo was taken today. Granted, while I took my next hockey game off (on the advice of my doctor), I did play the one after that and the one after that and then the one after that. And then I played five hockey games in three days3 – I had a weekend tournament, a regular season game, and then got called in as a spare for a friend’s team. And in the tournament I happened to get slashed *twice* directly on my thumb! Also, after the game, there seems to always be at least one person in the handshake lineup who won’t take off their glove to shake hands4 and so when I go to shake their hand they end up jamming their hockey glove directly into my thumb and it hurts like a mofo! 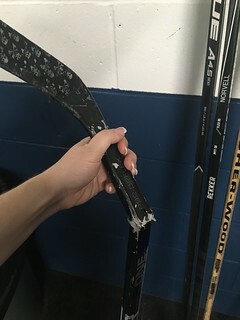 In other hockey news, I broke my hockey stick in my game yesterday. I was battling for the puck in the corner and as I was skating away afterwards, I thought my stick felt funny. I looked down and didn’t see anything odd, but after a few more strides it still felt funny and I looked again and heard a weird noise as I lifted my stick to try to look closer and then I saw it flop a bit. Yikes! 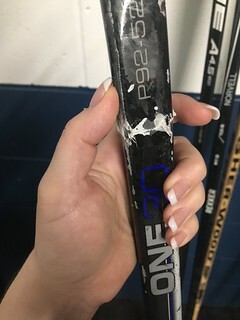 I immediately dropped my stick – as a player must drop a broken stick because it’s dangerous to skate around with one – and skated to the bench so someone else with a stick could jump on the ice. Fortunately I had brought a spare stick – as I’m a 5 ft tall person who plays left-handed, there’s not likely to be anyone else who has a stick that I can play with – so was able to jump back out on my next shift. 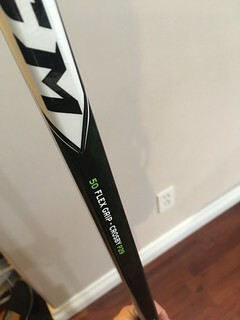 So I’m going to blame my *terrible* statistics for the last few years on my inappropriate stick and I am confident I’ll now be scoring like gangbusters. Playoffs, here I come!